This dish is treated as 'prasad' of Ganeshji & make it during Ganesh Festival. It is an assumption that this one is favorite food of Ganesh Bappa. Make a dough of wheat flour. In one bowl make mixture of coconut , cardamom powder & jaggery. this mixture is a filling for modak. Grease palm with oil, take one puri on hand, fill a spoonful mixture at center of puri. Gather outer edges of puri & make a modak of it(alternatively Modak maker can be used for making modak). repeat the procedure for all puri. 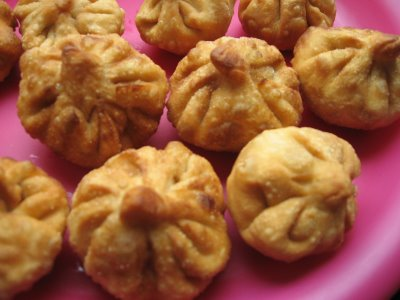 Modak can makes with different ingredients, this one is most simple form of modak. hi madhu, fry the modak in oil. please complete your recipe...what is one supposed to do with the prepared modaks?steam?fry?